It made me ponder. What he did do with the bodies? And what did the others do to deserve the sentence of death and he to be only fined and imprisoned? 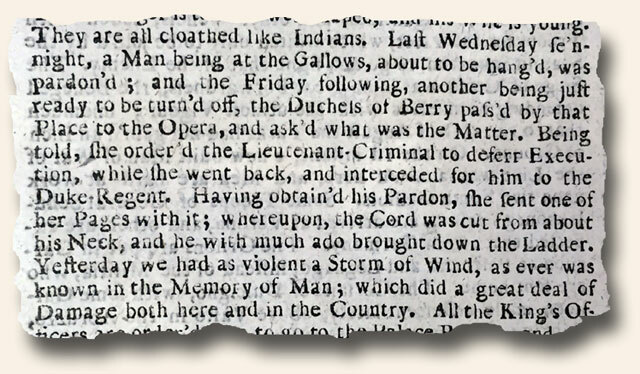 I journeyed today to Gloucester, England, through The Glocester Journal dated March 23, 1767. I found an interesting article “Last week the skeleton of a man in setters, with one jaw and some of the large bones perfect, was dug up in removing some ground in our Castle Green, eastward of the ruins of the old County Hall, memorable as the place wherein was held the fatal black assize, in the year 1577… upwards of 500 other persons were infected by a gaol disease, and died between the sixth of July and the tenth of August. 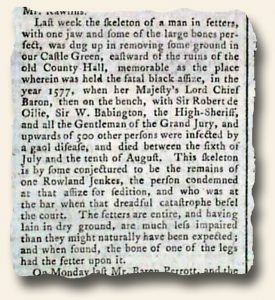 This skeleton is by some conjectured to be the remains of one Rowland Jenkes, the person condemned at the assize for for sedition, and who was at the bar when the dreadful catastrophe befel the court…”. This was pertaining to the “Black Assize”. Political cartoons are ever-present in our world today. It would be difficult to find a daily or weekly publication today without at least one. And they have been around for a long time–perhaps longer than you might think. 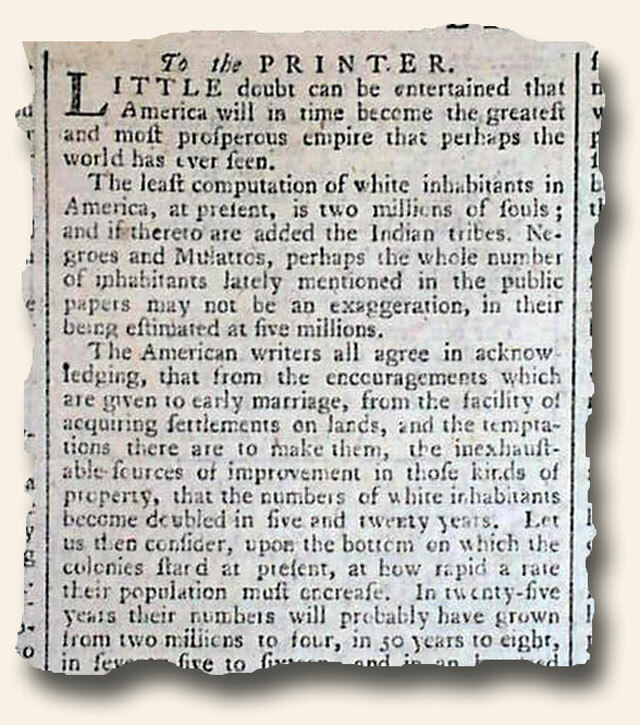 There was the occasional political cartoon in 18th century magazines, only a few of which are American-themed, and fewer still can be found as most have been removed years ago. Although we have had a few in years past, we recently purchased not only a very nice one, but one from a title difficult to find in today’s world of collecting. 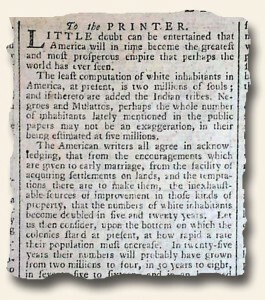 The November, 1776 issue of “The London Magazine: Or, Gentleman’s Monthly Intelligencer”, not to be confused with the more common “Gentleman’s Magazine”. 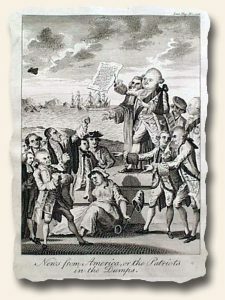 A full page plate in the issue has a very political cartoon themed on the Revolutionary War, captioned: “News From America, or the Patriots in the Dumps.” and shows Lord North standing on a platform holding a letter announcing successful campaigns by the British troops in America. A distraught woman, ‘America’, holding a liberty cap, sits at the base of the platform. Others present react to the news. There are several websites concerning this political cartoon, one of which can be seen here. Today my journey took me to London, England, by the means of The Post Boy dated September 20, 1716. There I found the Ottoman-Venetian War was going strong with little relief for the Turks. Even their truce request of a couple hours in order to bury dead had been denied. Then only to be faced with coming into battle with nails and iron and iron spikes being hidden in the sand and planks at the Communication Bridge which lamed their horses and then to be fired upon by cannon and small shot, killing more men. Today I traveled to England by The Post Boy dated April 17, 1716. 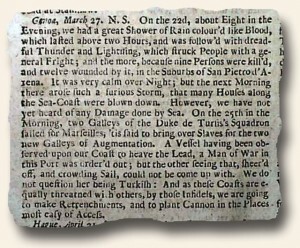 I found a most intriguing report from Genoa, “On the 22d, about Eight in the Evening, we had a great Shower of Rain colour’d like Blood, which lasted above two Hours, and was follow’d with dreadful Thunder and Lightning, which struck People with a general Fright; and the more, because nine Persons were kill’d, and twelve wounded by it, in the Suburbs of San Pietrod’ Arena. It was very calm over Night; but the next Morning there arose such a furious Storm, that many Houses along the Sea-Coast were blown down…”. I know for certain that I would not have wanted to experience those storms! 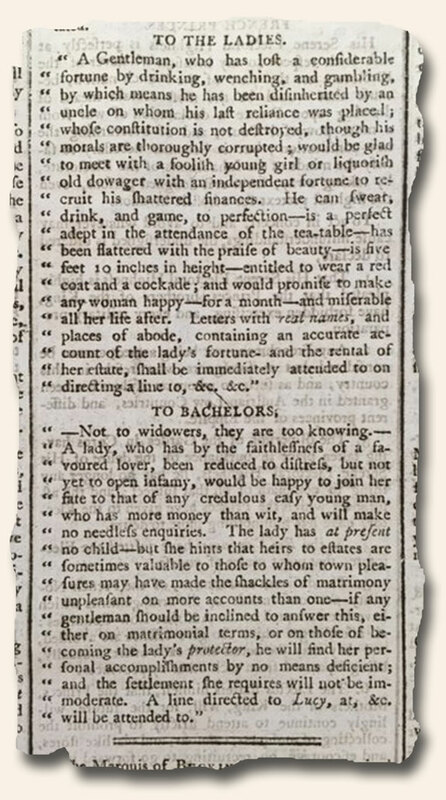 From a time before internet dating, the Dec. 30, 1791 issue of “The Morning Post“ from London contains an interesting–and hopefully tongue-in-check–report headed: “Advertisements Matrimonial” which provides amusing reading if nothing else. “Liar, Liar” in print – what if people desiring a mate through ads in newspapers had to write what they were really wanting??? Enjoy. Some of the most noteworthy events in history have humble beginnings. 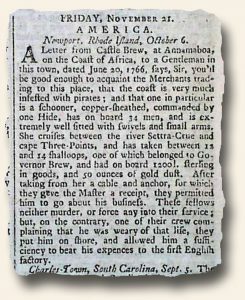 Such is the case with the announcing of the passage of The Stamp Act in The Gentleman’s Magazine, March, 1765. Under the Historical Chronicle section is the rather inconspicuous note, “Lord Mansfield, as speaker, and the Earls Gower and Marchmont, by virtue of a commission from his majesty, gave the royal assent to the following bills: …for laying a stamp duty in the British colonies in America.” While this official notification of the Stamp Act most likely flew under the radar of most readers of the day, there is no doubt regarding its significance. I wonder which one-liners which go unnoticed today will prove similar ten years from now?